Lenovo ThinkPad 10 Gen 2, 128GB, Wi-Fi 4G (Unlocked), 10.1in - Black. eMMC4.51, 128GB. These units were opened, factory reset with Lenovo Recovery tool and put back in their original boxes. Lenovo WRITEit. Lenovo ThinkPad 1839-AJ6 12GB, Wi-Fi, 10.1in - Black. Condition is Used. Shipped with USPS Priority Mail. Comes with Case and Bluetooth keyboard and charger. Lenovo ThinkPad 8 with 64gb of storage. Ships in original box. Fully functional. Touch screen is cracked but works 100%. Has screen protector. No Exceptions. We would be happy to assist you. Gurnee, IL 60031. EssDee Incorporated. Also subject to change especially during peak periods. Good – This item is previously used and will show signs of wear and tear from normal use. Item is in good condition may have minor to moderate surface scratches, scuffs. Barely used, fully tested and working, reset to manufacturer default. KINDNESS TALKS AND RUDENESS WALKS. If you are having a problem with an item. Every item, unless noted, is sold "AS IS" and has no. it ems - If there is a problem. ThinkPad 183825U Tablet Computer. 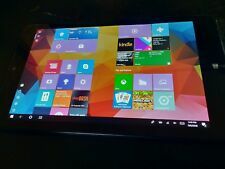  ThinkPad 183825U Tablet Computer. Lenovo Group Limited. Active Matrix TFT Color LCD.  AC Adapter. 1280 x 800. Weight (Approximate). Physical Characteristics. Screen and unit in excellent condition. Smart Cover: ThinkPad 8 Smart Cover Black. After market case with detachable Bluetooth keyboard. Hard Drive: 64GB eMMC Integrated Storage. Other integrated features include a 2.0MP fixed-focus front webcam, an 8MP rear webcam with auto-focus and an LED flash, three microphones, and dual 0.5W stereo speakers. Included with this tablet is a Lenovo ThinkPad Pen Pro stylus, a Pogo Keyboard, and a 45W USB Type-C AC adapter. 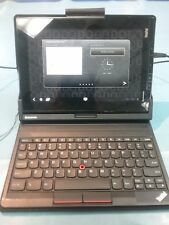 Lenovo ThinkPad 10 128GB, Wi-Fi, 10.1in - Black. Condition is Used. Shipped with USPS Priority Mail. ,128GB EMMC,4GB RAM MTM:20C3S0KX00. 1x128GB EMMC. Lenovo ThinkPad 10 still in Non-Opened Security Seal plastic bag. Includes: ThinkPad 10, AC Power Adapter, Power Cord, Tablet Digitizer Pen, Getting Started Guide, and Initial Setup Instructions. What you see pictured are photos from my inventory. But rest assure that over 90% of our images are original, and of the actual part. So you can imagine what our team goes through in order to keep this website up to date! And they do an excellent job at it! The tablet is fully functioning and was tested prior. Lenovo ThinkPad 18386GF 16 GB Tablet - 10.1"
Manufacturer Part Number: 18386GF. Product Model: 18386GF. Screen Size: 10.1" Product Name: ThinkPad Tablet (1838-6GF) Product Line: ThinkPad. Manufacturer: Lenovo Group Limited. Manufacturer Part Number 20CD00B1US. Product Model 20CD00B1US. 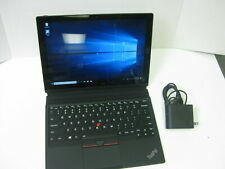 ThinkPad S1 Yoga 20CD00B1US 2 in 1 Ultrabook. This computer has been professionally factory reset and office 2007 installed ready for its new owner. Product Line. Not Applicable. Internet Connectivity. This unit is in excellent condition. KINDNESS TALKS AND RUDENESS WALKS. If you are having a problem with an item. Every item, unless noted, is sold "AS IS" and has no. it ems - If there is a problem. No power adapter included. KINDNESS TALKS AND RUDENESS WALKS. If you are having a problem with an item. Every item, unless noted, is sold "AS IS" and has no. it ems - If there is a problem. You work hard. You're flexible. When life says, "Go," you never slow down. The sleek ThinkPad X380 Yoga is designed for you. This stylish powerhouse adapts to work with you-as a laptop, tablet, or anything in between. Great condition Lenovo Yoga S1 laptop. Windows 10 Pro recognizes the shift to tablet mode as well. Mfr Part #: 20NR000DUS. ThinkPad L390 20NR000DUS Notebook. Processor Type: Core i5. The L Series, as with all of the ThinkPad family, boasts legendary reliability, our award-winning, spill-resistant keyboards, security options, and superior web-conferencing at cost-conscious pricing. 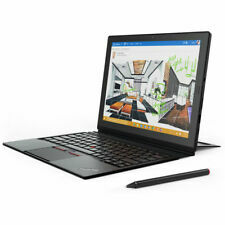 LENOVO THINKPAD HELIX 36984LU . i5-3337U @ 1.8GHz, 4GB RAM, 180GB SSD, WIN 10 . We do not replace used Batteries. Model Number 20JCS0PE00. Storage Capacity 256 GB. Installed RAM 8 GB. Maximum Supported RAM 8 GB. Product Type Tablet PC. RAM Speed 1866 MHz. RAM Technology LPDDR3 SDRAM. Interfaces 1 x USB-C 3.1, 1 x USB 3.0, 1 x Mini DisplayPort, 1 x Headphone/Microphone combo Jack, 1 x SD Card Slot Reader. ThinkPad L380 20M7000HUS Notebook. Processor Type: Core i5. The L Series, as with all of the ThinkPad family, boasts legendary reliability, our award-winning, spill-resistant keyboards, security options, and superior web-conferencing at cost-conscious pricing. Mfr Part #: 20LD001FUS. ThinkPad X1 Yoga 3rd Gen 20LD001FUS 2 in 1 Ultrabook. Touchscreen: Yes. Processor Generation: 8th Gen. Display Screen Type: LCD. Finger Print Reader: Yes. Screen Size: 14". AC Adapter.